a. where and when did chemistry begin? b. what are the related sciences that make use of chemistry? c. where can a chemist work after graduation? 10 pts. for the best answer. We don’t know. Chemistry outgrew from alchemy, which has been around an unknown length of time. a. The chinese have been experimenting with salt peter mixtures and using them to develope various “gun powders” since about the 9th century. I’d call that chemistry. The best place to learn about it would be here. b. Most sciences relate and make use of it but especially astronomy, physics, material science, biology, and geology. I would suggest that physics is less so, and that biology, and material sciences depend on it more so than the others. 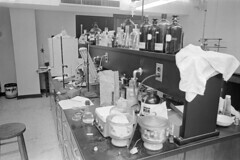 c. Analytical labs, Environmental testing and field work, Engineering positions, material science work, food industry work, pharmaceutical labs, crime scence investigation(tough to get a job here, few positions), any production facilities like manufacturers of hair spray and shaving cream all need chemists. The money is in the pharmaceutical and engineering positions, run away from environmental and analytical as they are horribly underpaid.